Down an unassuming road off Lavender Hill, a few minutes from Clapham Junction station, you’ll be greeted by the sight of a house covered in what looks at first like peeling, abstract patterns in muted greens and blues. Step closer and the vivid details of an intricate mural emerge. Celebrated bandstand at the center of what was once the worst slum in London. Historic church where a number of Shakespeare's actors are buried. Giant, friendly pelicans in Central London, the most unlikely of places. 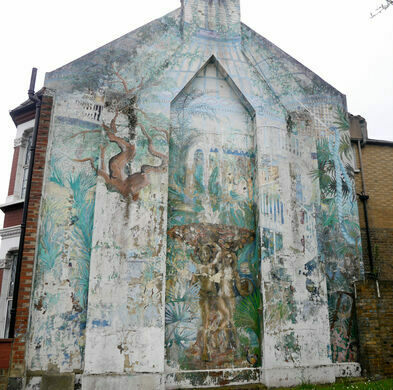 The Tapestry of Life mural is the work of Christine Thomas and was painted in 1983 with support from the Wandsworth Arts Resource Project. Depicting a Garden of Eden scene featuring Adam and Eve rendered in soft brown tones at its center, the design was inspired by the greenhouses at Kew Gardens. The design includes a snake, kingfishers, chickens, a monkey, peacocks, a frog, and the distinctive spiral staircases found at the botanical gardens at Kew. A little girl peeks out from one corner, near a bush of pink flowers. The piece took six months to paint and the finished product was unveiled by author and botanist David Bellamy. Sadly, the mural has aged over the decades. Due to the use of regular house paint and its exposure to the elements, the Tapestry of Life is now somewhat faded and large patches are peeling away. 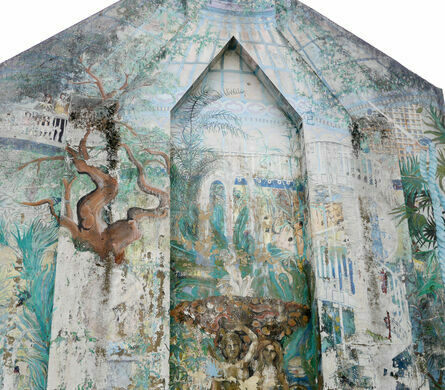 Despite its state of disrepair, the mural retains its charm; if you’re in the area, it’s worth making a detour to see it while it lasts. 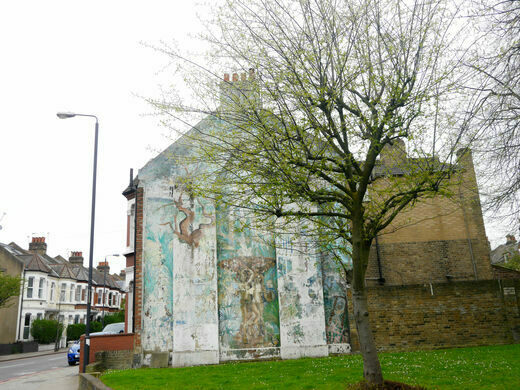 The mural is in London's Battersea neighborhood a few minutes away from Clapham Junction station, near Battersea Library. An urban farm housed within a previously abandoned World War II bomb shelter. A memorial to a memorial to a dog that inspired rioting in the streets of London. This small collection of rare books was uniquely locked up for safe keeping. A priest with no formal artistic training used basic house paint to create gorgeous religious scenes inside this historic church. This once-forgotten oasis in the middle of Lisbon was first created over a century ago quite by accident.